Astronomers used the ALMA (Atacama Large Millimeter Array) and VLT (Very Large Telescope) to determine that star-forming processes in the very distant galaxy MACS1149-JD1 began at an unexpected early stage, just 250 million years after the Big Bang. The results of the research will be published on 17 May 2018 in the magazine "Nature". Observations using ALMA have detected a weak glow emitted by ionized oxygen from the MACS1149-JD1 galaxy, and scientists found the signal to have been emitted 13.3 billion years ago (500 million years after the Big Bang) making it the farthest oxygen ever detected by a telescope. The presence of oxygen in the galaxy is a clear sign that there must have been previous generations of stars. During the first millions of years of the Universe's existence, oxygen was absent. It was (like all elements heavier than hydrogen and helium) created only by the fusion of stars and then released with their death. Oxygen detection in the MACS1149-JD1 indicates that the first generations of stars formed and produced oxygen as early as 13.3 billion years ago. 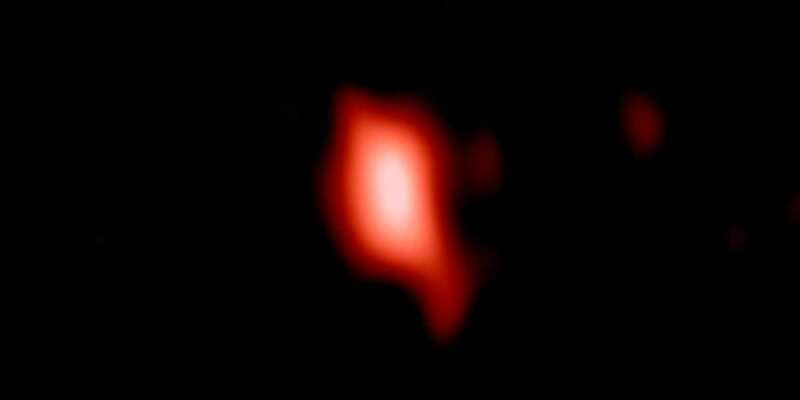 In addition to the oxygen seen by ALMA, the Very Large Telescope detected a weaker signal from hydrogen emissions. The distance to the galaxy from these observations shall be consistent with the distance estimated from the observation of oxygen. This makes the MACS1149-JD1 the farthest galaxy in the world whose distance has been estimated precisely and the furthest ever observed by ALMA or VLT. To find out exactly when the first stars were born, the team reconstructed the history of the MACS1149-JD1 using infrared data collected by Hubble Cosmic Telescopes and Spitzer Cosmic Telescopes. It turned out that the observed brightness of the galaxy could be well explained by a model where the onset of star formation corresponds to a time of only 250 million years after the Big Bang. Research also suggests that the first galaxies were formed much earlier than we are now able to observe. The photo at the top shows the MACS1149-JD1 galaxy as seen by the ALMA observatory.